As we left Nashville on I-24, we noticed the environment began to change. From East Texas through Louisiana, Mississippi and Alabama, we drove through piney woods and forest areas. Between Huntsville, AL and Nashville, TN, the environment began to open up a bit. Crossing into Kentucky, I thought WOW – Big Sky country. It seemed weird to see openness along the highway. Also, after seeing all the brown grass in Northern Alabama, the grass in Kentucky began to green up a bit. PS – Both hands were on the wheel when this photo was taken. Needing fuel, we stopped at Walmart (Murphy Oil) in Clarksville, TN. Clarksville is named after the Clark from Lewis & Clark. Fort Campbell, about 10 miles north of town, straddles the Tennessee/Kentucky state line and is home to the 101st Airborne Division and the 160th Special Operations Aviation Regiment. Lots of military families live in Clarksville. 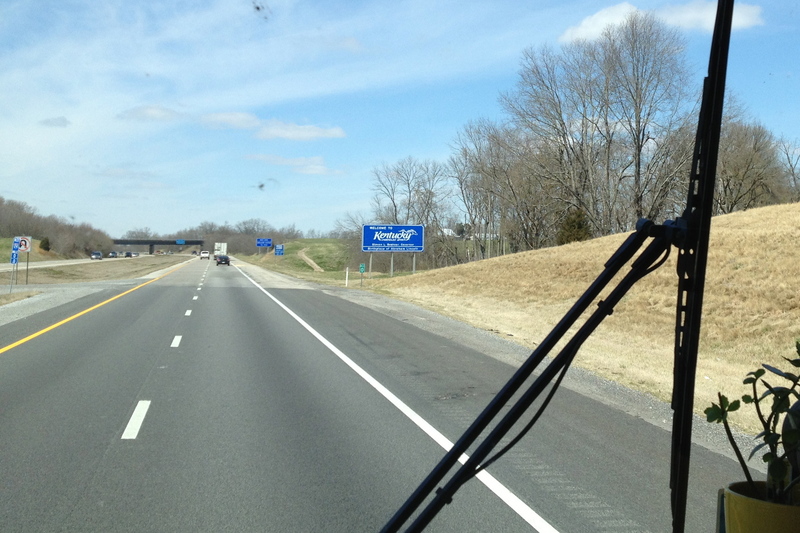 We continued our northwest track on I-24 for about 100 miles to Paducah, KY. Why Paducah, KY? The original plan was for Carol’s sister Donna from The Happy Traills and her husband, Tom, to drive up from South Texas to meet us in Paducah. Donna and Carol are quilters and wanted to visit Hancock’s of Paducah and the National Quilt Museum. Following a two-day stay in Paducah, we were going to drive together to St. Louis for a couple of days. Unfortunately, they had a mechanical breakdown in Tyler, TX and have been stuck there waiting for parts for their motor home. This meet up just aint gonna happen. 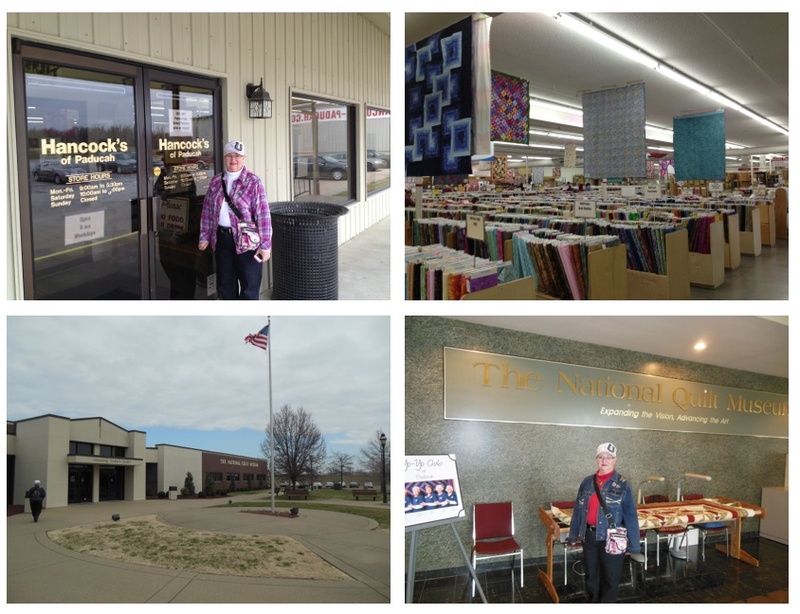 I took Carol to Hancock’s of Paducah and the National Quilt Museum. Hancock’s of Paducah is not associated to Hancock Fabrics chain. They are the leading online store specializing in quilting fabrics and supplies. Because of exhibits and classes, the National Quilt Museum has become a destination stop for quilters and fabric artists. I am always amazed to see what quilters can create from fabric and thread. Many of the quilts on display took several years to complete. Photographs are not allowed in the museum so you will need to click the link above to see some of what they have. 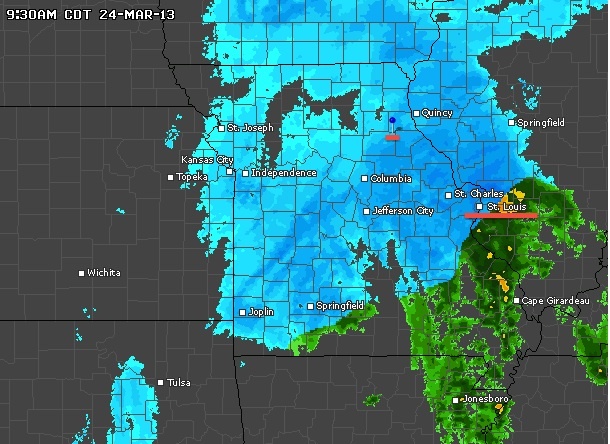 The weather forecast on the local news indicated a major winter storm was headed to St. Louis on Sunday. As we investigated this storm we discovered the forecast was for snow and hazardous driving from Saturday evening through most of Sunday. So we decided to stay in Paducah until Monday rather than take a chance of getting caught in a storm on the road. This weather map was from 9:30AM today. Notice the red line under St. Louis, this is our next stop. The blue represents snow. It stretches all the way to the western edge of Missouri. Snow forecast for St. Louis is for 8″-11″ accumulation. Just above Columbus is another red line just below a dark blue dot. That is Mark Twain Campground in Monroe City where we are headed next week. Forecast for Monroe City is 6″-9″ accumulation. Paducah is just below and to the right of Cape Girardeau. The green means we will get a little more rain. I think we made a good decision to stay put for a couple of days. So today we are staying in. Carol has fixed crock pot stew with corn bread for dinner and we are enjoying a movie marathon day. Hopefully the weather will clear up Monday and we can get back on the road. This entry was posted in Travel and tagged paducah, Quilt, snow. Bookmark the permalink. Hey, we’re having crock pot stew tonight, too! Dave bought some crusty bread at the store just now instead of the cornbread. Looks like a night for hunkering down, and I’m glad ya’ll decided to lay low for a couple of days. We’re doing the same, getting ready for yet another winter storm rolling in tonight through tomorrow. Hope your new gig works out well! Safe travels when you hit the road on Monday.